You know homeopathy is bogus; but your child doesn’t! 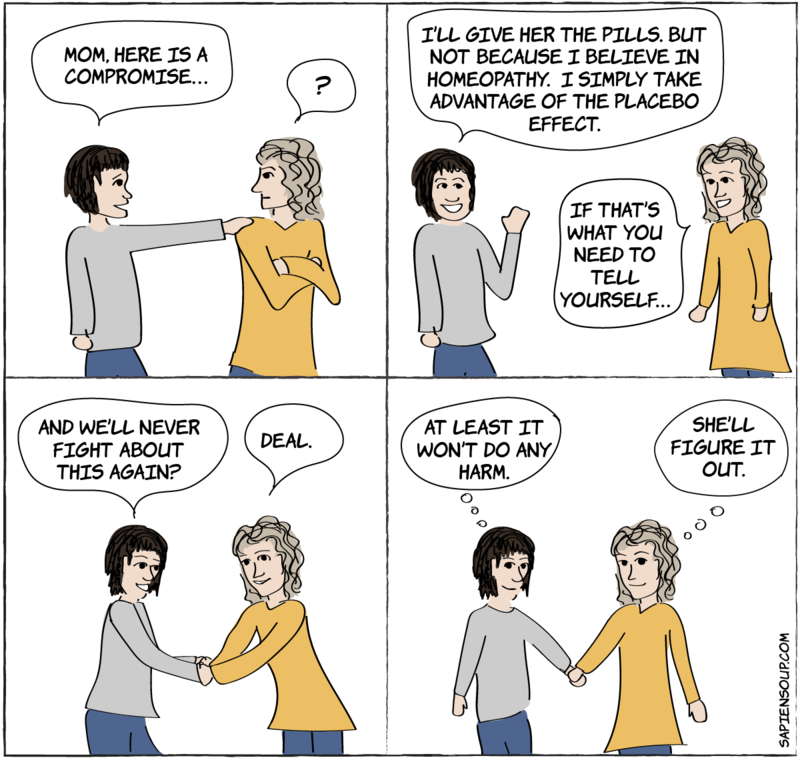 The Power of Placebo: How you and your family can get a great deal out of homeopathy without actually believing in it. My mom and I have had this conversation a gazillion times. Then, last Christmas, we got into a full-blown fight. Study after study shows, that homeopathy has no effect beyond placebo.1 Same is true for acupuncture, cupping and some other types of so called complementary medicine.2 The placebo effect however is powerful and worth further investigation. Placebos cause measurable changes in neurobiological signaling pathways. Here is how it works: when you are in pain and your doctor prescribes a pain medication, your prefrontal cortex forms an expectation of something positive. Reward pathways in the brain get activated and cause the release of endorphins. Endorphins make you feel good and—more importantly—bind to opioid receptors (much like morphine) and therefore act like a natural pain killer. Placebo effects are even known in surgery. The outcomes of actual arthroscopic knee surgery for arthritis has proven to be no better than sham surgery.5 Both types of surgery produced the same positive results in patients. The more information is shared about the effects of the pretended medicine, the stronger the placebo effect. Generally, an organism gravitates towards health. Meaning, that most minor health issues like stress, pain, fatigue, cough, muscle tension, inflammation and the like are temporary and will get better on their own. Bouncing back to normal can be accelerated or at least less debilitating thanks to drugs. But that comes at the costs of side effects. Pain meds stress the stomach. Antidepressants kill your libido. Coffee makes you sweat. Prescription drugs come with effects and side effects. Furthermore, clinical trials for a new drug are often biased or even manipulated. I highly recommend listening to the three-part series Bad Medicine on Freakonomics Radio if you want to learn more about modern medicine. And believe me, you do! My personal credo is, that if I can abstain from medication, I will. Here’s where homeopathy comes in. No side effects is only true if the original substance is diluted to the point of inefficacy. The scandal around Hyland’s teething tablets shows how substandard manufacturing practices can pose a real threat to consumers. Inconsistent amounts of atropa belladonna aka deadly nightshade were found in the tablets, possibly harming hundreds of babies. They might even be linked to the death of eight babies over the past 10 years. This scandals makes me reconsider my choice of placebo. Fortunately some pharmacies produce non-homeopathic placebo pills, which don’t contain any active ingredient, not even theoretically. Personally I’ll go with those in the future. Let me know what you use as placebo. 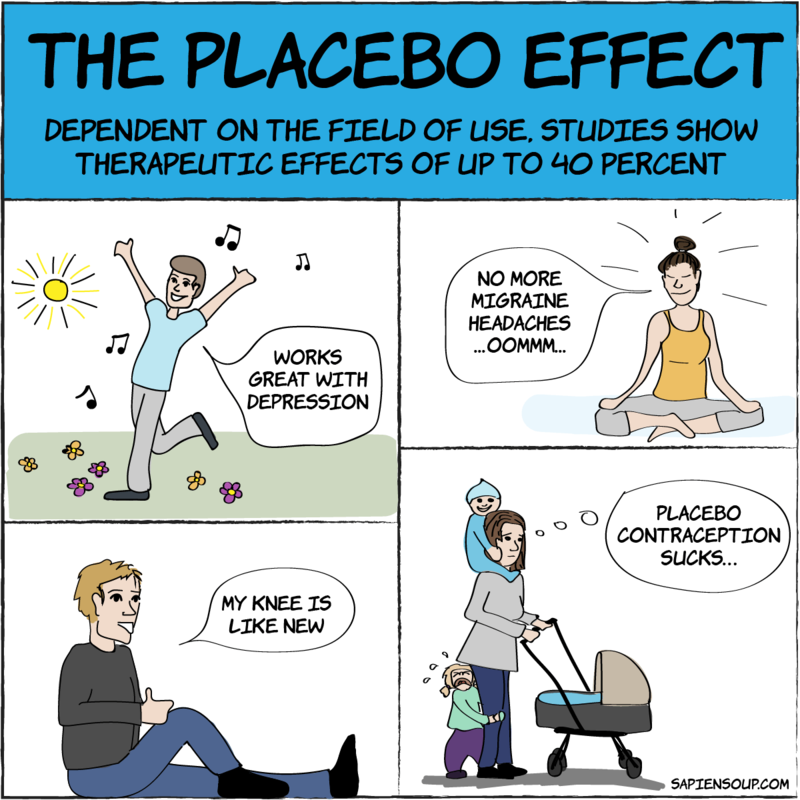 In my estimation, placebo can be useful for all kinds of minor aliments like headache, cough, runny nose, anxiety, etc. Eventually children would bounce back to normal on their own, but with a powerful placebo I have experienced that I can speed up the process. As a parent you have superpowers. Your child sees you as all-knowing and almighty. If you tell them that this medicine will heal their boo-boo, the placebo effect will rise to its fullest effect. With the best of intentions we lie about Santa Claus. Why not lie about medicine too? My daughter is a young toddler. Together we’ve been through multiple colds, infections, teething and all kinds of children’s diseases. I know when I can get away using a placebo and when it’s time for real medicine. For example: I wouldn’t treat an acute ear infection with a placebo, but a mild to moderate cold—no problem! Generally, my goal is to go for as long as possible without actual medication. Is prescribing a placebo ethical? Intentionally deceiving patients would go against most doctor’s ethics. But in a doctor-parent-child relationship this is of no concern. The physician gives full disclosure to the parent who makes an informed decision about their child’s treatment. Connect with your child and make sure to get their full attention. Explain to your child that this medicine will help them heal. Explain precisely what it will do and when. The more (age appropriate) information you give your child the better they can form expectations. Create a ritual. Children love rituals and let them play an active role in the administration of the pills. You could—for example—chant a magic spell and when the pills are swallowed make your child clap three times to seal the spell. Repeat the ritual multiple times per day. My daughter barely understands the concept of medicine yet. But when I pull out the pills and drops, she knows magic is about to happen. Hokus Pokus Fidibus, Abra Kadabra! She loves it.